One suburban man's attempt to get ready by 2012 while holding down a day job because you can't be too sure. In polite company should one never discuss politics? A while back I declared a truce with the gophers. They, however, did not see my white flag. Last week, they went at one of the two agave plants I have in the backyard. I think the gophers attacked the plant’s roots because the agave was weak from overwatering. I had recently pruned the mesquite tree behind it and also planted a brittlebush beside it. Both activities involve a couple of deep watering. 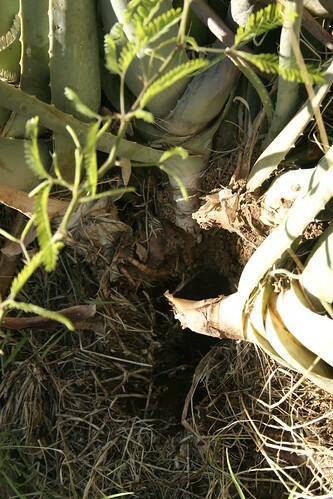 I think the water caused root rot on the agave and the gophers saw a weakness. This is the first time the gophers have committed a frontal attack on one of the plants in the yard. I have decided to surrender in my war against the gophers for four reasons. I am a highly ineffective opponent. They are clearly winning. Assuming regular new holes means they are doing just fine. I am not confident that they are doing any harm to the garden or the trees, I think they eat the grubs, which I think can do harm to the garden. So I have already been feeling guilty about being mean to them when I did not really have a good reason. I don’t think they would be healthy to eat unless one was desperate. I am tired of getting hate replies for being mean to animals. Man, I really am not good with conflict. This could be an issue when society descends into barbarians at the gate. I have yet to kill much less catch a gopher. I will spare you the details because otherwise you would think I am cruel. Despite the fact I have yet to even coming close to catching a gopher, much less killing, skinning, cooking and eating one, at some point I am going to have to think about cooking. If I lived in the Appalachian’ foothills of my youth then wood would not be a problem. 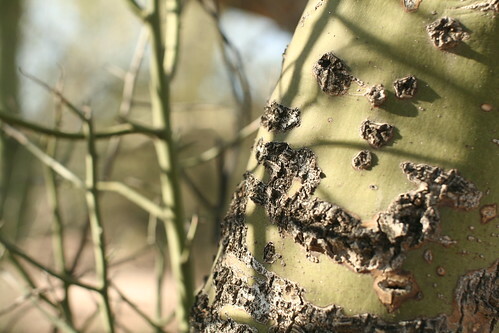 But here in Phoenix it might be, the desert wants for lack of enough wood for multiple fires. The wood is good for starting fires, but not good for keeping one burning for hours on end days in a row. There would be wood to burn from abandoned buildings, but it might take a while for people to abandoned buildings wholesale, and even if they did, a constant pillage of smoke would advertise you to the roaming pillagers, gangs and exiles. So next experiment will be building a solar oven, goal is to boil water, that would be two birds one stone. And one stone for two birds is a good rule of thumb to follow after Armageddon. I am not sure if one can actually boil water in a solar heater, I hear tales of Ray Reeve’s doing experiments with a TV screen, but I plan to try. From what I read, I need 5 walls of tinfoil, a glass wall, a door to go in and out, and some way to hold the pot. In the meantime, anybody got some black sheets of metal I can have for the stove? At the risk of sounding all Bill Murray via Caddyshack, this weekend will be my first experiment with trying to snare the gophers in my backyard. Previous attempts at trying to get them to walk into a beer cooler laid on its side and nibble of some radish leaves attached by rubber ban to the prop stick failed miserably. My two favorite Youtube videos on how to lay out the trap are John in the Forest and these two English kids. If I am lucky enough to get one then I will have skin it and cook it. I plan to either make stew or cook them on the grill. Maybe I should watch Caddyshack again for inspiration. This weekend was mostly a research weekend. First, I re-visited the Arizona Desert Botanical Garden and snapped off some more pictures of plants that I can use for food. I also spent a couple of hours staring at the place I plan to have my garden, and trying to figure out how I would approach it and realized I had no idea of how to start. So I decided to swing by The Grow House in beautiful Downtown Phoenix and study what they had going on. The Grow House is an urban farm, which means they took a regular house and are wringing as much food out of it as possible. I ended up meeting a gentleman (whose name I think was Brandian) who gave me a quick down and dirty tour. The most important lesson was to make sure you make good berms to catch the water. He said when he first moved out here from New Jersey, he had a hard time with all the “good soil and space” they were wasting on making berms, but he eventually “just had to let that go.” A good berm is the key to growing in AZ. He was not as considered about the East-West vs North-South issue. Next step on Garden is to research a site suggested by Melinda, PBS- Victory Garden. I also did a bunch of reading about how to snare animals and read somewhere along the way that guitar strings make for good snares. Apparently I know a lot of people who have old guitar strings. I thought about making a donation box at the Trunk Space but Steph, the owner, is a vegetarian so maybe I should not do that. She got really mad at me when I told her my story about eating monkey meat. I am going to do my first attempt at snaring the gophers in my yard next weekend. My plan is to then skin and eat the gopher. On another side note, my first attempt at gathering manure failed. Anybody know where I can get my hands on some poop?